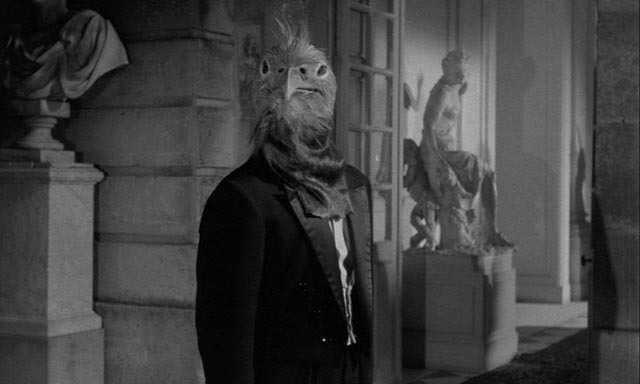 The first appearance of Judex in Franju’s homage to Feuillade: a figure of myth and mystery. In 1997, Olivier Assayas (in what remains his finest film) paid homage to the great French cinema pioneer Louis Feuillade while simultaneously declaring the impossibility of recreating a work from another era with modern sensibilities. Irma Vep is an account of an attempt to remake Feuillade’s 1916 serial Les Vampires; but the attempt ultimately collapses through the clash of contemporary sensibilities with those of an age which now seems so distant as to be alien. Assayas’ film ends with the complete disintegration of cinematic language under the strain. And yet, thirty-four years earlier, another French filmmaker attempted the same feat and to some degree succeeded. Georges Franju, best known for the poetic horror film Les yeux sans visage (Eyes Without a Face, 1959), although working at the same time as the directors of the New Wave, had a very different sensibility from Godard, Truffaut, Malle, Chabrol and the rest. His work often looks back rather than forward, and it’s not surprising that he was eager to tackle a new version of one of Feuillade’s serials. Franju wanted to do Fantomas (1913-14), but discovered that the rights had already been sold (leading to a series of pastiche features); what was available was Judex, the serial made after Fantomas and Les Vampires, and to some degree the conservative Feuillade’s atonement for the magnificent criminality of those two masterpieces. Judex was the story of a righteous avenger seeking justice for the crimes of banker Favraux (Michel Vitold), which had ruined Judex’s own father. 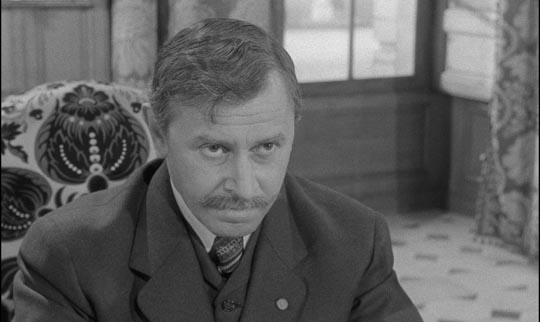 Franju’s lack of interest in this character resulted in a strange sense of detachment in his film; Judex (played by American magician Channing Pollock) remains a cipher, a mere function of the melodramatic plot stripped of individual psychology (Franju eliminates any backstory which might explain his actions). 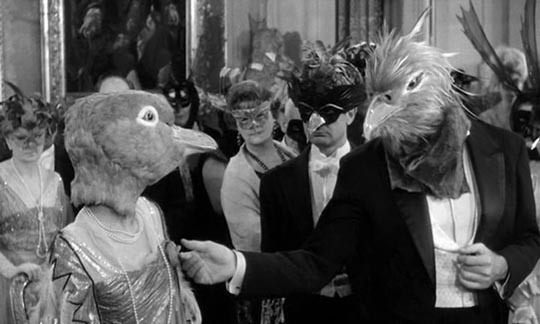 But this hollowed-out figure nonetheless provides the film with an almost mystical dimension; he is introduced in the film’s most visually striking sequence, revealed first in a slow tilt up from his feet to his bird-masked head on Favraux’s veranda, then picking up a dead dove and walking with the bird held out in front of him into the house and through the masked ball in progress. Turning at last to face the guests, many also in bird masks, Judex gives the dove a quick shake and it comes to life and flies around the room. There is no narrative explanation or purpose to this scene; rather it establishes the idea that anything can happen, that beneath the realistically depicted surface of the film, there is the potential for magic. This refers back to the often absurdly dense and complicated plotting of Feuillade’s original serials, which nonetheless have an almost documentary fidelity to place and social detail. One of the most fascinating aspects for a modern viewer of the serials is the location photography, the visual capturing of a material world which no longer exists. Franju also is careful to honour the material world, even though his film is set in period – the mansions, the hovels, the old cars and the country roads echo the world we see in Feuillade’s films, and yet because Franju’s Judex was made in 1963, that world takes on the air of a memory, or perhaps more appropriately of a dream. 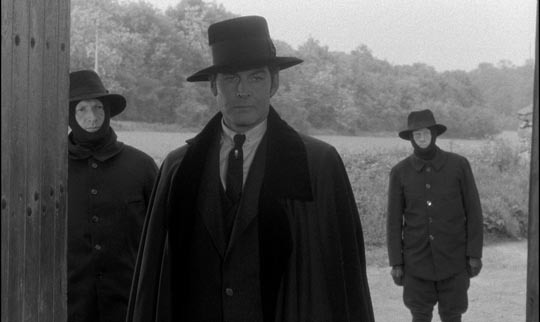 This feeling is enhanced by Franju’s stripping of the narrative of much of the connective tissue we would expect in a coherent plot; scenes play out as self-contained fragments which we piece together ourselves to make sense of. Towards this aim, Franju uses the devices and syntax of silent film – there’s a remarkably focused simplicity to the camerawork, just as there is in Feuillade’s serials. We see only what is essential, without any directorial embellishment. Franju, through the striking black and white photography of Marcel Fradetal, returns cinema to its origins in the simple wonder of seeing. Judex evokes a kind of childlike delight in its accumulation of story details which don’t need explanation or the belabouring of theme. At one point, he even has the detective Cocantin (Jacques Jouanneau) reciting Lewis Carroll’s Lobster Quadrille to a delighted little girl named Alice. Judex, avoiding the knowing pastiche of silent cinema which defines the work of Guy Maddin, is more like the embodiment of a memory of Feuillade by someone who saw the serial long ago and desires to recapture the essence of that childhood experience. 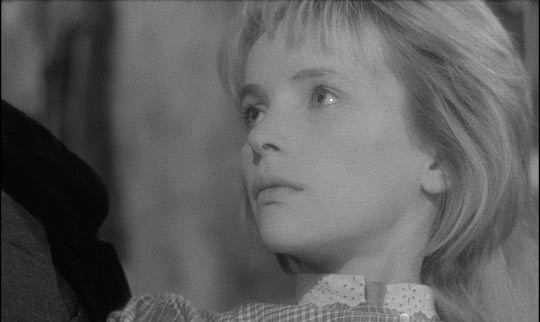 As a result, Judex feels like a ritual reiteration of melodramatic elements – the criminal banker, the righteous avenger, the wronged man seeking justice – with Franju’s major energies devoted to the two female leads: the good Jacqueline (Edith Scob), daughter of Favraux who renounces her inheritance when she learns of her father’s crimes, and the evil Diana Monti (Francine Berge), who desires only to profit, whether that involves marrying Favraux for his money or using the banker’s incriminating papers to blackmail others. These women are mirror images, with Scob (something of a muse for Franju, who used her in a number of films) delicate and ethereal, pale and dressed in white, and Berge, dark and erotically physical, dressed in black (even at one point disguised as a nun). Diana is visually modeled on Musidora, the original Irma Vep, and she provides the film with its essential energy. 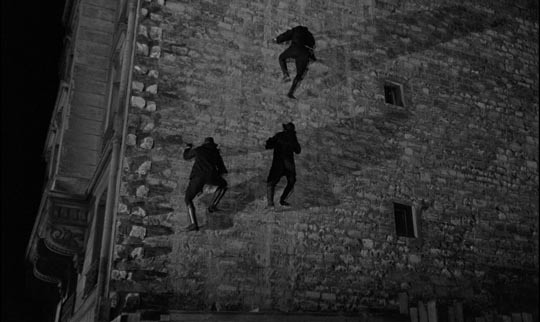 As in his desire to remake Fantomas, this chaotic force of social anarchy is obviously what really attracted Franju in Judex. A work of beautiful surfaces and ephemeral moods, Judex seems from moment to moment rather static, and yet as in a dream each moment seems to grow unexpectedly out of the one preceding and eventually (if only in retrospect) they gather together to form a comprehensible narrative in which in the final moments good seems to triumph, evil is vanquished, and order is restored … at least, it seems so until the final title card over Judex and Jacqueline walking on a beach: “In homage to Louis Feuillade, in memory of a time that was not happy: 1914.” Yes, Judex has triumphed for the moment, but that moment is the brief stillness before all hell breaks loose and social order is shattered irreparably. I can’t speak for Criterion’s Blu-ray as I’ve only seen the two-disk DVD edition, but even in standard definition, the 1.66:1 image, scanned in 2K from the original camera negative, is striking in its clarity, with a rich range of greys. The original mono soundtrack is as pristine as the picture. Criterion as usual provides a hefty selection of supplements to support the film, beginning with an interview with co-writer Jacques Champreux (11:57), Feuillade’s grandson, which was originally available on the Masters of Cinema region 2 DVD release of Judex (paired with Franju’s second meditation on Feuillade, Nuits Rouges ). There is also an interview with actress Francine Berge (10:56), who recounts being hired by Franju because she “looked evil”. Then there’s Franju, le Visionnaire (51:28), a documentary on Franju from the French television series Cinema de notre temps (a perennial source of interesting supplements on Criterion releases), put together in 1998 by Andre S. Labarthe from several previous programs containing Franju interviews from the early ’60s to the ’80s. The director speaks at length about his aim to “make the unreal real” and his affinity with Feuillade, who portrayed the most outrageous events with a straightforward documentary-like visual style. Finally, the set includes two short films by Franju from early in his career, before he turned to features. Hotel des Invalides (1951, 22:24) is a documentary about the military museum in Paris attached to the home for severely injured soldiers, juxtaposing the valourization of historical weaponry with images of men whose wounds have left them crippled and deformed. Le grand Melies (1952, 31:21) is a warm and moving homage to another of Franju’s cinematic heroes, the pioneering showman and innovator Georges Melies. With Melies’ son playing his father, Franju recreates some of the remarkable (and remarkably simple) techniques with which Melies produced his illusions. This short film tells the same story as Martin Scorsese’s Hugo, but does so more effectively, with greater emotional impact, and without all those CG excesses which paradoxically worked against Melies’ imaginative achievement. The accompanying booklet contains an essay on Judex by critic Geoffrey O’Brien which does an excellent job of capturing the very special flavour of the film. This entry was posted in Review and tagged Criterion, Directors, DVD, French Film. Bookmark the permalink.